Response: Eyewitnesses of crimes often have to attempt to make identification decisions as to whether the police suspect is, or is not, the real culprit of the crime. In an identification parade (UK), or a lineup (US), the suspect is presented alongside similar-looking people (who are known to be innocent) and the witness has to identify the real culprit if he or she is there, or state that the real culprit is not present. Eyewitness identification decisions can be very influential in how a case progresses through the criminal justice system. An incorrect identification can result in a guilty person going free, or an innocent person being charged of a crime they did not commit. So generally speaking, our research investigates which identification procedures enhance a person’s ability to identify a guilty suspect. In our study, we wanted to find out how the police should accommodate suspects with distinctive facial features (e.g., tattoos, scars, piercings, bruising) in lineups. If the police suspect stands out in a lineup because he has a distinctive feature, this is not a good test of the witness’s memory. The witness might pick the suspect simply because it is obvious that he is the focus of the police investigation. Alternatively, the witness might pick the suspect just because he is the best match—but not necessarily an exact match—to their memory of the culprit, compared to the other lineup members. Basically, if a distinctive suspect stands out, a witness is likely to pick the distinctive suspect, even if he is not the real culprit. Estimates suggest that over one third of all police suspects have distinctive facial features. But police guidelines on how to accommodate distinctive suspects in lineups are not currently guided by research—in fact, there are thousands of studies on lineups, but only a handful that explore lineups for distinctive suspects. In our study, we examined three techniques currently used by the police to prevent distinctive suspects from standing out and compared these techniques to doing nothing to prevent the distinctive suspect from standing out. Let’s say the suspect has a black eye. One thing the police might do is digitally add a black eye to all of the other faces in the lineup (i.e., “replication”). Or, they might cover up the suspect’s black eye and cover up a similar area on the faces of the other lineup members. In practice, the police can cover up the feature by either overlaying the area of the feature with a black block (i.e., “block”), or by pixelating the area of the feature (i.e., “pixelation”). 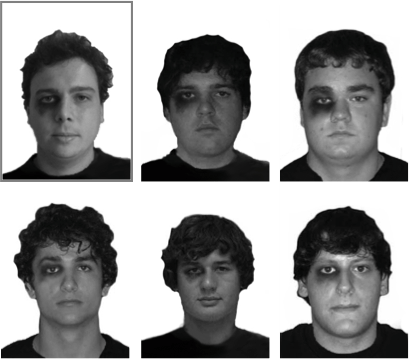 In our study, we compared replication, pixelation and block lineup techniques against lineups in which nothing was done to prevent a distinctive suspect from standing out—that is, lineups in which the suspect was the only person with a black eye.